For other uses, see Amalgam (disambiguation). An amalgam is an alloy of mercury with another metal, which may be a liquid, a soft paste or a solid, depending upon the proportion of mercury. These alloys are formed through metallic bonding, with the electrostatic attractive force of the conduction electrons working to bind all the positively charged metal ions together into a crystal lattice structure. Almost all metals can form amalgams with mercury, the notable exceptions being iron, platinum, tungsten, and tantalum. Silver-mercury amalgams are important in dentistry, and gold-mercury amalgam is used in the extraction of gold from ore. Dentistry has used alloys of mercury with metals such as silver, copper, indium, tin and zinc. Amalgam is an excellent and versatile restorative material and is used in dentistry for many reasons. Zinc amalgam finds use in organic synthesis (e.g., for the Clemmensen reduction). It is the reducing agent in the Jones reductor, used in analytical chemistry. Formerly the zinc plates of dry batteries were amalgamated with a small amount of mercury to prevent deterioration in storage. It is a binary solution (liquid-solid) of mercury and zinc. For the alkali metals, amalgamation is exothermic, and distinct chemical forms can be identified, such as KHg and KHg2. KHg is a gold-coloured compound with a melting point of 178 °C, and KHg2 a silver-coloured compound with a melting point of 278 °C. These amalgams are very sensitive to air and water, but can be worked with under dry nitrogen. The Hg-Hg distance is around 300 picometres, Hg-K around 358 pm. Phases K5Hg7 and KHg11 are also known; rubidium, strontium and barium undecamercurides are known and isostructural. Sodium amalgam (NaHg2) has a different structure, with the mercury atoms forming hexagonal layers, and the sodium atoms a linear chain which fits into the holes in the hexagonal layers, but the potassium atom is too large for this structure to work in KHg2. Sodium amalgam is produced as a byproduct of the chloralkali process and used as an important reducing agent in organic and inorganic chemistry. With water, it decomposes into concentrated sodium hydroxide solution, hydrogen and mercury, which can then return to the chloralkali process anew. If absolutely water-free alcohol is used instead of water, an alkoxide of sodium is produced instead of the alkali solution. Aluminium can form an amalgam through a reaction with mercury. Aluminium amalgam may be prepared by either grinding aluminium pellets or wire in mercury, or by allowing aluminium wire or foil to react with a solution of mercuric chloride. This amalgam is used as a reagent to reduce compounds, such as the reduction of imines to amines. The aluminium is the ultimate electron donor, and the mercury serves to mediate the electron transfer. The reaction itself and the waste from it contain mercury, so special safety precautions and disposal methods are needed. As an environmentally friendlier alternative, hydrides or other reducing agents can often be used to accomplish the same synthetic result. Another environmentally friendly alternative is an alloy of aluminium and gallium which similarly renders the aluminium more reactive by preventing it from forming an oxide layer. Tin amalgam was used in the middle of the 19th century as a reflective mirror coating. A variety of amalgams are known that are of interest mainly in the research context. Thallium amalgam has a freezing point of −58 °C, which is lower than that of pure mercury (−38.8 °C) so it has found a use in low temperature thermometers. Gold amalgam: Refined gold, when finely ground and brought into contact with mercury where the surfaces of both metals are clean, amalgamates readily and quickly to form alloys ranging from AuHg2 to Au8Hg. Lead forms an amalgam when filings are mixed with mercury  and is also listed as a naturally occurring alloy called leadamalgam in the Nickel-Strunz classification. Dentistry has used alloys of mercury with metals such as silver, copper, indium, tin and zinc. Amalgam is an "excellent and versatile restorative material" and is used in dentistry for a number of reasons. It is inexpensive and relatively easy to use and manipulate during placement; it remains soft for a short time so it can be packed to fill any irregular volume, and then forms a hard compound. Amalgam possesses greater longevity when compared to other direct restorative materials, such as composite. However, this difference has decreased with continual development of composite resins. Amalgam is typically compared to resin-based composites because many applications are similar and many physical properties and costs are comparable. Mercury has been used in gold and silver mining because of the convenience and the ease with which mercury and the precious metals will amalgamate. In gold placer mining, in which minute specks of gold are washed from sand or gravel deposits, mercury was often used to separate the gold from other heavy minerals. After all of the practical metal had been taken out from the ore, the mercury was dispensed down a long copper trough, which formed a thin coating of mercury on the exterior. The waste ore was then transferred down the trough, and gold in the waste amalgamated with the mercury. This coating would then be scraped off and refined by evaporation to get rid of the mercury, leaving behind somewhat high-purity gold. 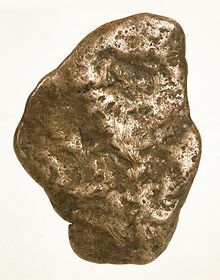 Mercury amalgamation was first used on silver ores with the development of the patio process in Mexico in 1557. There were also additional amalgamation processes that were created for processing silver ores, including pan amalgamation and the Washoe process. Gold amalgam has proved effective where gold fines ("flour gold") would not be extractable from ore using hydro-mechanical methods. Large amounts of mercury were used in placer mining, where deposits composed largely of decomposed granite slurry were separated in long runs of "riffle boxes", with mercury dumped in at the head of the run. The amalgam formed is a heavy solid mass of dull gray color. (The use of mercury in 19th century placer mining in California, now prohibited, has caused extensive pollution problems in riverine and estuarine environments, ongoing to this day.) Sometimes substantial slugs of amalgam are found in downstream river and creek bottoms by amateur wet-suited miners seeking gold nuggets with the aid of an engine-powered water vacuum mounted on a float. 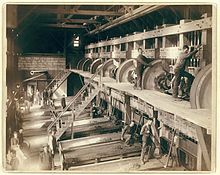 Where stamp mills were used to crush gold-bearing ore to fines, a part of the extraction process involved the use of mercury-wetted copper plates, over which the crushed fines were washed. A periodic scraping and re-mercurizing of the plate resulted in amalgam for further processing. Amalgam obtained by either process was then heated in a distillation retort, recovering the mercury for reuse and leaving behind the gold. As this released mercury vapors to the atmosphere, the process could induce adverse health effects and long term pollution. Today, mercury amalgamation has been replaced by other methods to recuperate gold and silver from ore in developed nations. Hazards of mercurial toxic waste have played a major role in the phasing out of the mercury amalgamation processes. However mercury amalgamation is still regularly used by small-scale gold placer miners (often illegally) & particularly in developing countries. Mercury salts are, compared to mercury metal and amalgams, highly toxic due to their solubility in water. The presence of these salts in water can be detected with a probe that uses the readiness of mercury ions to form an amalgam with copper. A nitric acid solution of salts under investigation is applied to a piece of copper foil, and any mercury ions present will leave spots of silvery-coloured amalgam. Silver ions leave similar spots but are easily washed away, making this a means of distinguishing silver from mercury. Hg2+ + Cu → Hg + Cu2+. ^ Callister, W. D. "Materials Science and Engineering: An Introduction" 2007, 7th edition, John Wiley and Sons, Inc. New York, Section 4.3 and Chapter 9. ^ a b E J Duwell; N C Baenziger (1955). "The Crystal Structures of KHg and KHg2". Acta Crystallogr. 8 (11): 705–710. doi:10.1107/S0365110X55002168. ^ "Die Sendung mit der Maus, Sachgeschichte vom Spiegel" (in German). Archived from the original on 17 April 2009. Retrieved 2009-04-24. ^ "Mercury Amalgamation". mine-engineer.com. Retrieved 8 April 2018. ^ "Mercury Regulation EU". www.europa.eu. ^ "The "Mercury Toxicity" Scam:: How Anti-Amalgamists Swindle People". www.quackwatch.com. ^ "Statement on Dental Amalgam". www.ada.org. ^ Mutter, Joachim (13 January 2011). "Is dental amalgam safe for humans? The opinion of the scientific committee of the European Commission". Journal of Occupational Medicine and Toxicology. 6: 2. doi:10.1186/1745-6673-6-2. PMC 3025977. PMID 21232090. Poliakoff, Martyn (2009). "Amalgams". The Periodic Table of Videos. University of Nottingham. "Amalgam" . The American Cyclopædia. 1879.